By the time of her 1964 death, Edaline Chatfield Rhea, Edward's only descendent, had cherished and safe-guarded her dad's Civil War letters for more than 40 years--occasionally re-reading them and, then, secreting them away again wherever she lived. Edaline's final residence was in Yuma, Arizona, where we found them after a prolonged search. They weren't in a drawer, a cupboard, a closet, or a storage box somewhere out in the garage. Edaline's dad's Civil War letters were far too important for that. They were Edaline's treasure and duty, requiring vigilant protection. We knew that Edaline intended them for Peg, her cousin, a high school history teacher; but, we couldn't' find them in the obvious places. We began to wonder if civic minded Edaline might have donated them away to ensure their safety. Fortunately, Peg thought to check under the bed before we left. And there they were, inside a swollen shoe box, bound by a loop of red yarn, over 100 Civil War letters, and more! That made sense. Edaline had hidden them away in the safest and most secure place she could imagine. What safer place could she find than under her single bed, against the far wall, where she slept every night--a night watchman of sorts! Her strategy had worked almost too well. Beneath Edward's letters rested a red and black binder filled with the carbon copied pages of the "Recollections and Extracts from the diaries of Private Riley Beach",a treasure that ultimately would add great detail to the events of Edward's capture and imprisonment. Edaline's beloved treasure and duty became ours on that hot day in August, 1964. 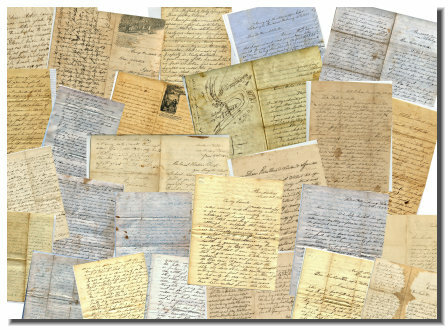 For 51 years, with great care, we protected Chatfield's Letters and Beach's recollections before arranging for their long-term preservation at the Huntington Library, San Marino, California. See the content details here. The Huntington sits 23 miles east of where Edward died in 1924: the "Old Soldier's Home" in Sawtelle, Los Angeles.